Watch Jason Gallagher, PharmD, discuss important pharmacokinetic properties to consider when prescribing antifungal therapy. *372 mg of isavuconazonium sulfate is equivalent to 200 mg of isavuconazole. †186 mg of isavuconazonium sulfate is equivalent to 100 mg of isavuconazole. ‡Start maintenance doses 12–24 hours after the last loading dose. A step-by-step tutorial on dosing, preparing, and administering CRESEMBA IV and PO formulations. 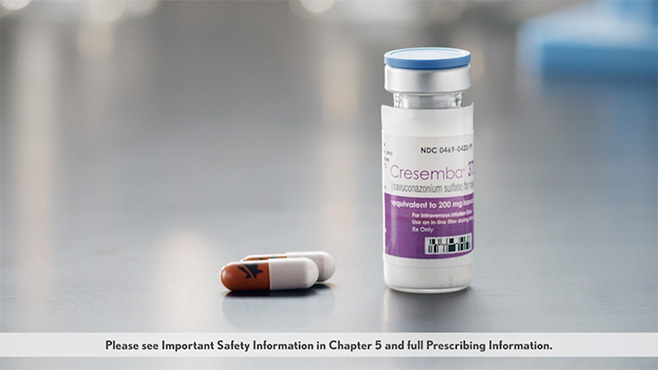 View information regarding the dosing & administration of CRESEMBA, which is indicated for the treatment of invasive aspergillosis and invasive mucormycosis in adults.